or Read The History of Errol Estate & C.C. by Harry J. Deck - info below. 1. James EDWARDS was born Abt 1821 in Angus,Forfar,Scotland. He married Jane SANDILANDS 14 OCT 1844 in Edinburgh Parish,Edinburgh,Midlothian,Scotland. She was born Abt 1813 in Colinton,Midlothian,Scotland. 2 i. James W. EDWARDS was born Abt 1845 in Edinburgh,Midlothian,Scotland. + 3 ii. William EDWARDS was christened 27 JUN 1846 in Edinburgh Parish,Edinburgh,Midlothian,Scotland. 4 iii. Jessie EDWARDS was born Abt 1848 in Edinburgh,Midlothian,Scotland. 5 iv. David EDWARDS was born Abt 1850 in Edinburgh,Midlothian,Scotland. 2. Willams EDWARDS was born in Wales. He married Mary Jane OWENS 1 FEB 1867 in Edinburg Parish,Edinburgh,Midlothian,Scotland. She was born in N. Ireland. + 3i. William Graham EDWARDS was born 29 NOV 1869 in Edinburgh,Ferfer,Scotland, and died 4 JUL 1934 in Apopka,Orange Co.,FL. 3. William EDWARDS (Willams EDWARDS1) was born 29 NOV 1869 in Edinburgh,Ferfer,Scotland, and died 4 JUL 1934 in Apopka,Orange Co.,FL. He was buried in Apopka Cemetery,Apopka,FL. He married Isobel Taylor STEWART 27 APR 1897 in Chicago,Cook Co.,IL, daughter of David STEWART and Margaret SMITH. She was born 31 May 1875 in Glasglow,Lenark,Scotland, and died 28 JUN 1939 in Orlando,Orange Co.,FL. She was buried in Apopka Cemetery,Apopka,FL. + 4 i. James Stewart EDWARDS was born 8 MAR 1898 in Chicago,IL., and died 19 MAR 1940 in Orlando,Orange Co.,Florida. + 5 ii. 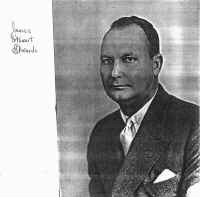 David Stewart EDWARDS was born 28 MAY 1904 in Orlando,Orange Co.,FL, and died 18 JUL 1954 in Orlando,Orange Co.,FL. 6 iii. Margaret Jean EDWARDS was born 1 NOV 1911 in Orlando,Orange Co.,FL, and died 9 APR 1977 in Tampa,FL. She married Alvin COOLEDGE. 7 iv. 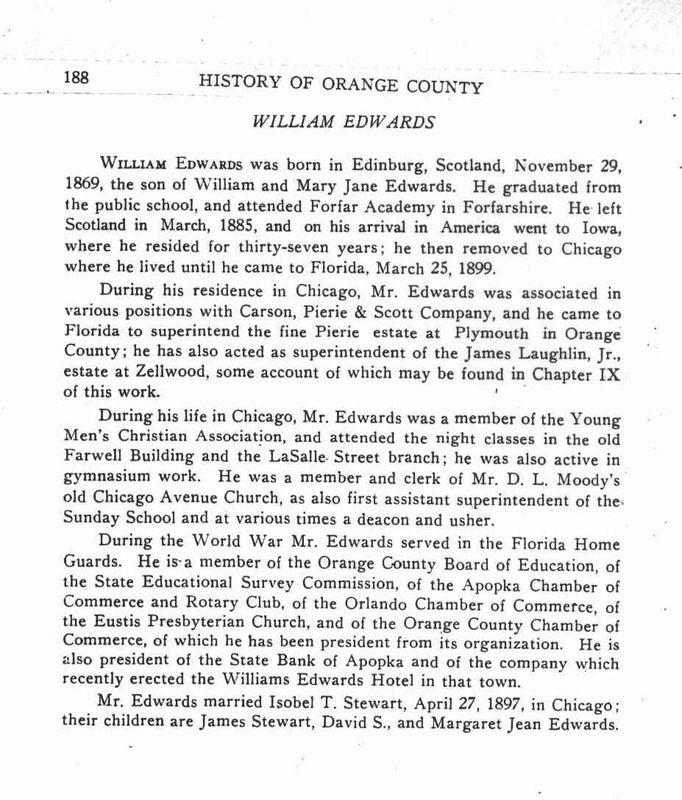 William EDWARDS was born 19 JUL 1900 in Orlando,Orange Co.,FL, and died 16 MAY 1906 in Orlando,Orange Co.,FL. 4. James Stewart EDWARDS (William EDWARDS2, Willams EDWARDS1) was born 8 MAR 1898 in Chicago,IL., and died 19 MAR 1940 in Orlando,Orange Co.,Florida. He was buried in Apopka Cemetery,Apopka,FL. He married Blanche G. ROER. She was born 1899 in Pennsylvania,USA, and died 26 NOV 1933. He married Ruth Gerould HOYT 28 MAR 1934 in Eustis,Florida, daughter of Hugh Percival HOYT and Katherine Elizabeth HOAG. She was born 21 JUL 1901 in Remus,Wheatland Township,Mecosta Co.,MI, and died 17 FEB 1994 in Shippensburg,PA.. She was buried in Riverside Cemetary,Lenawee Co.,Clinton,MI. + 8 i. William Graham EDWARDS was born 1 FEB 1924 in Orlando,FL., and died 1 NOV 1994 in Atlantis,FL..
9 i. Stewart Hoyt EDWARDS was born 20 FEB 1937 in Orlando,Fl., and died 20 FEB 1937 in Orlando,Fl..
+ 10 ii. Ruth Ann EDWARDS. 5. David Stewart EDWARDS (William EDWARDS2, Willams EDWARDS1) was born 28 MAY 1904 in Orlando,Orange Co.,FL, and died 18 JUL 1954 in Orlando,Orange Co.,FL. He was buried in Apopka Cemetery,Apopka,FL. He married Dorothy Baker. He married Grace Elizabeth MITCHELL 2 NOV 1938 in Orlando,Orange Co.,FL, daughter of Frank Livingston MITCHELL and Grace May DASKAM. He married Christine HERZOG. 11 i. Nancy Lee EDWARDS. She married Jean Ellis MABRY. + 12 i. Pamela Jean EDWARDS was born 23 AUG 1947 in Orlando,Orange Co.,FL, and died 29 SEP 1992 in Palm Springs CA..
+ 13 ii. David Stewart Jr. EDWARDS. 8. William Graham EDWARDS (James Stewart EDWARDS3, William EDWARDS2, Willams EDWARDS1) He married Maxine Codell GERWIG in Tangerine,FL..
14 i. Corrine Marie EDWARDS. She married William B. HARVEY. 15 ii. 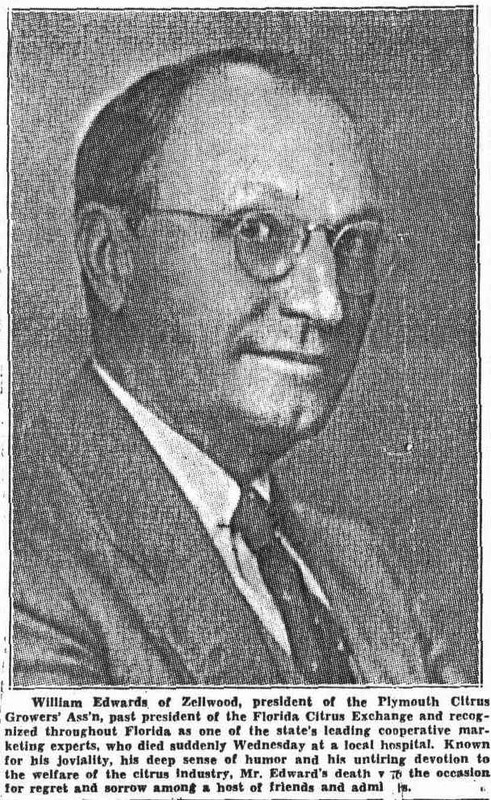 William Graham EDWARDS, Jr. He married Patricia Lee UNKNOWN. 18 ii. Andrew Edwards FORDHAM. 12. Pamela Jean EDWARDS (David Stewart EDWARDS3, William EDWARDS2, Willams EDWARDS1) was born 23 AUG 1947 in Orlando,Orange Co.,FL, and died 29 SEP 1992 in Palm Springs CA.. She was buried in St. George,Washington Co.,UT. She First married Abner Milland ADAMS. She Second married Richard Craig LLEWELLYN, son of James Richard LLEWELLYN and Irene CARPENTER. + 20 i. Leah Melania LLEWELLYN. + 21 ii. Heather Loraine LLEWELLYN. + 22 i. James David LLEWELLYN. 23 ii. John Richard LLEWELLYN. 24 iii. Jared Thomas LLEWELLYN. 25 iv. Allison Renee LLEWELLYN. 26 v. Kristine Marie LLEWELLYN. 27 i. Debbie EDWARDS. She married Richard KELPERIS. 14. 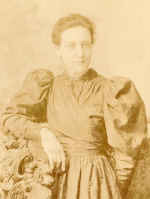 Corrine Marie EDWARDS (William Graham EDWARDS4, James Stewart EDWARDS3, William EDWARDS2, Willams EDWARDS1) She married Wiilliam B. HARVEY. 17. Benjamin Oliver III FORDHAM (Ruth Ann EDWARDS4, James Stewart EDWARDS3, William EDWARDS2, Willams EDWARDS1) He was born 9 Jul 1966 in Houston, TX . He married Jennifer Maria JENSEN . 19. James David LLEWELLYN (Pamela Jean EDWARDS4, David Stewart EDWARDS3, William EDWARDS2, Willams EDWARDS1). He married Jennifer KNUDSEN. 33 i. Emma Haley LLEWELLYN. 20. Leah Melania LLEWELLYN (Pamela Jean EDWARDS4, David Stewart EDWARDS3, William EDWARDS2, Willams EDWARDS1). She married Bruce Eric GRAHAM..
35 ii. Grace Abagail GRAHAM. 37 i. Tiffany Anne Marie RUSH. 38 i. Cassady Erin JURGAITIS. 39 ii. Jackson Paul JURGAITIS. 1. Daniel STEWART was born 1743 in Newburgh,Fife,Scotland. He married Janet Butter 22 APR 1775 in Errol,Perth,Scotland, daughter of John Butter and Isabel NAIRN. She was born 6 SEP 1747 in Errol,Perth,Scotland, was christened 6 SEP 1747 in Errol,Perth,Scotland. 2 i. Margaret STEWART was born 10 SEP 1775 in Newburgh,Fife,Scotland, was christened 10 SEP 1775 in Newburgh,Fife,Scotland. + 3 ii. David STEWART was born 25 DEC 1776 in St. Andrews,Fife,Scotland. 4 iii. Jean STEWART was born 5 FEB 1779 in St. Andrews,Fife,Scotland. 5 iv. John Stein STEWART was born 25 JUL 1780 in St. Andrews,Fife,Scotland. 6 v. Stein STEWART was born 7 JAN 1782 in St. Andrews,Fife,Scotland. 7 vi. James Stein STEWART was born 12 APR 1785 in St. Andrews,Fife,Scotland. 8 vii. Jean STEWART was born 1 MAY 1787 in St. Andrews,Fife,Scotland. 3. David STEWART (Daniel STEWART1) was born 25 DEC 1776 in St. Andrews,Fife,Scotland. He married Janet (Jesse) CURROSS 7 AUG 1802. She was born 1778 in Forgan,Fife,Scotland. 9 i. David STEWART was born 4 DEC 1802 in Balmerino,Fife,Scotland. He married Agnes MELVILLE. She was born MAR 1809 in Balmerino,Fife,Scotland, was christened 12 MAR 1809 in Balmerino,Fife,Scotland. 10 ii. James STEWART was born 24 MAR 1805 in Forgan,Fife,Scotland. He married Janet GARDINER 14 JUL 1827. 11 iii. Elizabeth STEWART was born 21 MAR 1807 in Forgan,Fife,Scotland, was christened 28 MAR 1807 in Forgan,Fife,Scotland. 12 iv. John STEWART was born 29 MAR 1809 in Forgan,Fife,Scotland, was christened 2 APR 1809 in Forgan,Fife,Scotland. He married Margaret DANDEY 15 JUN 1842. 13 v. Janet (Janette) STEWART was born 13 MAY 1811 in Forgan,Fife,Scotland, was christened 19 MAY 1811 in Forgan,Fife,Scotland. She married James WIGHT 4 JUN 1847. + 14 vi. Alexander STEWART was born 14 JAN 1814 in Forgan,Fife,Scotland, was christened 28 JAN 1814 in Forgan,Fife,Scotland, and died 14 OCT 1895 in Balmerino,Fife,Scotland. 15 vii. Catherine STEWART was born 8 APR 1816 in Forgan,Fife,Scotland. She married Thomas JOHNSTON 1 DEC 1843. He was born 29 AUG 1819 in Balmerino,Fife,Scotland. 14. Alexander STEWART (David STEWART2, Daniel STEWART1) was born 14 JAN 1814 in Forgan,Fife,Scotland, was christened 28 JAN 1814 in Forgan,Fife,Scotland, and died 14 OCT 1895 in Balmerino,Fife,Scotland. He was buried OCT 1895. He married Isabel TAYLOR 29 MAR 1845 in Balmerino,Fife,Scotland. She was born 16 JUL 1824 in Balmerino,Fife,Scotland, and died 26 OCT 1900 in Balmerino,Fife,Scotland. She was buried OCT 1900. + 16 i. David STEWART was born 22 MAY 1845 in Balmerino,Fife,Scotland, and died 7 NOV 1901 in Apopka,Orange Co.,FL. 17 ii. James STEWART was born 18 AUG 1846 in Balmerino,Fife,Scotland. + 18 iii. Helen STEWART was born 12 OCT 1848 in Balmerino,Fife,Scotland. 19 iv. Jesse STEWART was born 13 APR 1851 in Balmerino,Fife,Scotland. 20 v. Alexander STEWART was born 1 FEB 1855 in Balmerino,Fife,Scotland. + 21 vi. 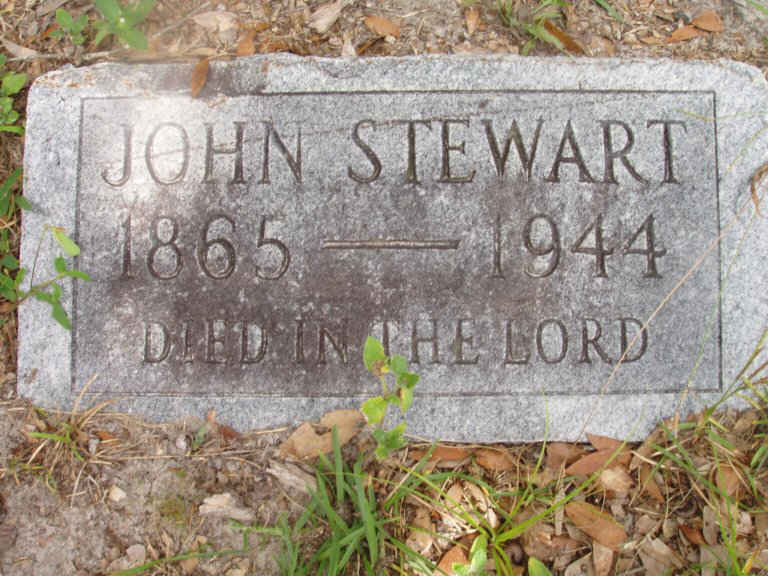 John STEWART was born 8 OCT 1865 in Balmerino,Fife,Scotland, and died 1944 in Apopka,Orange Co.,FL. 16. 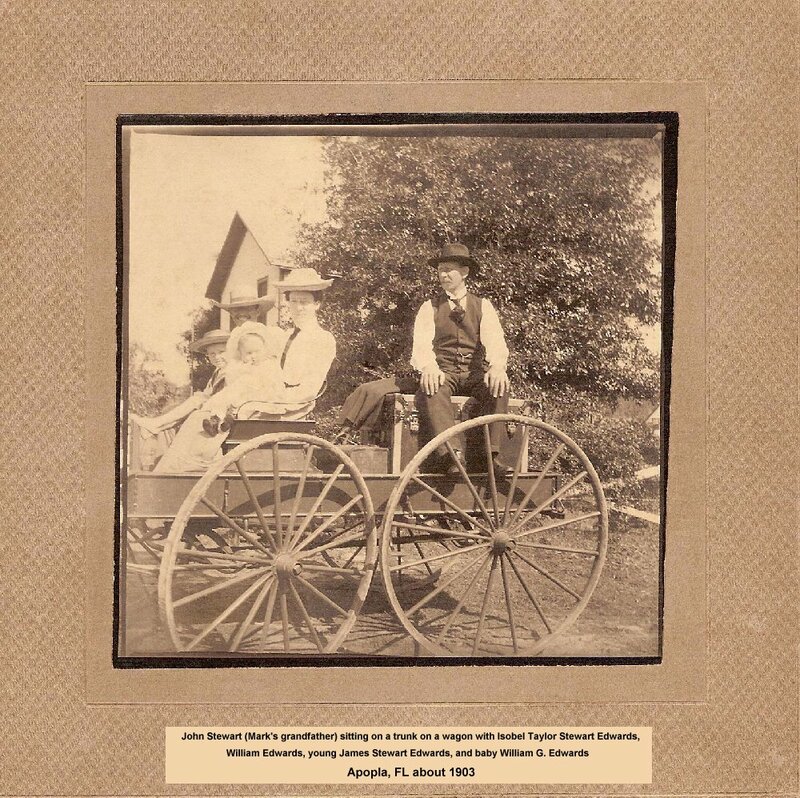 David STEWART (Alexander STEWART3, David STEWART2, Daniel STEWART1) was born 22 MAY 1845 in Balmerino,Fife,Scotland, and died 7 NOV 1901 in Apopka,Orange Co.,FL. He was buried NOV 1901 in Apopka Cemetery,Apopka,Orange Co.,FL. He married Margaret (Maggie) SMITH 3 MAR 1871 in Edinburgh Parish,Edinburgh,Midlothian,Scotland, daughter of John SMITH and Mary Brodie TAYLOR. She was born 7 JUL 1855 in Cockpen,Midlothian,Scotland, and died 18 NOV 1921 in Apopka,Orange Co.,FL. 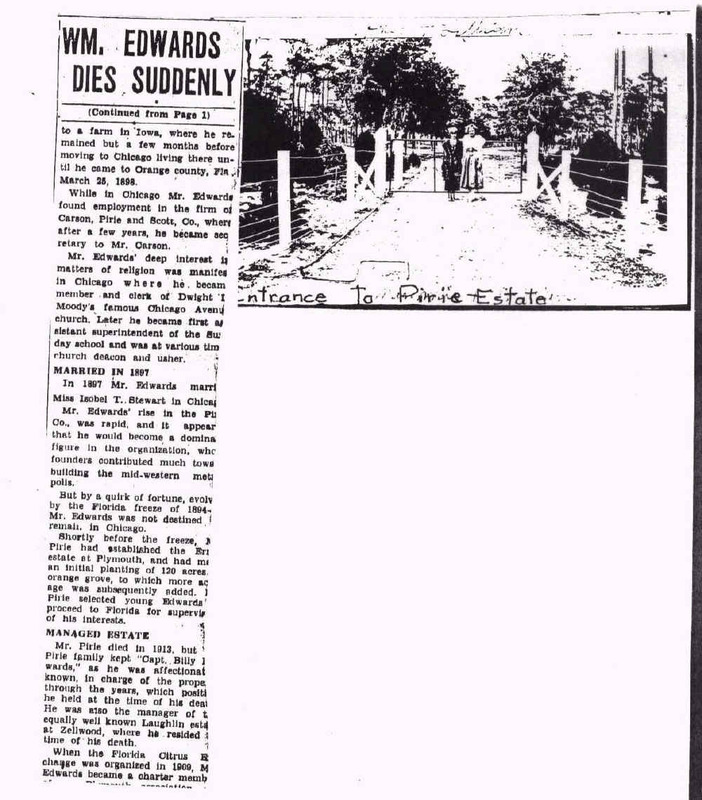 She was buried NOV 1921 in Apopka Cemetery,Apopka,FL. + 22 i. Isabella (Isobel) Taylor STEWART was born 31 MAY 1875 in Glasglow,Lanark,Scotland, and died 28 JUN 1939 in Orlando,Orange Co.,FL. 23 ii. Margaret STEWART was born 1877. 24 iii. Donald Alexander STEWART was born 12 SEP 1879 in Gourock,Renfrew,Scotland. 18. Helen STEWART (Alexander STEWART3, David STEWART2, Daniel STEWART1) was born 12 OCT 1848 in Balmerino,Fife,Scotland. She married Walter SCOTT 7 OCT 1870. He was born 15 NOV 1848 in Balmarico,Fife,Scotland. 25 i. Walter SCOTT was born 1 DEC 1873 in Balmarico,Fife,Scotland. 21. 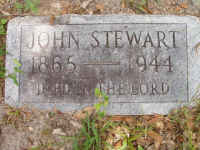 John STEWART (Alexander STEWART3, David STEWART2, Daniel STEWART1) was born 8 OCT 1865 in Balmerino,Fife,Scotland, and died 1944 in Apopka,Orange Co.,FL. He was buried 1944 in Apopka Cemetery,Apopka,FL. He married Gladys Viola DAVIS 9 AUG 1923. She was born 1889, and died 1958 in Quincy,Gadsden Co.,FL. + 29 i. James STEWART was born 2 JUN 1924 in Plymouth,Apopka,Orange Co.,FL, and died 16 MAY 1995 in Mt. Pleasant,Gadsden Co.,FL. + 30 ii. John Alek STEWART was born 12 NOV 1927 in Apopka,Orange Co.,FL, and died 11 MAR 1999 in Fort Walton Beach,Okaloosa Co.,FL. 22. 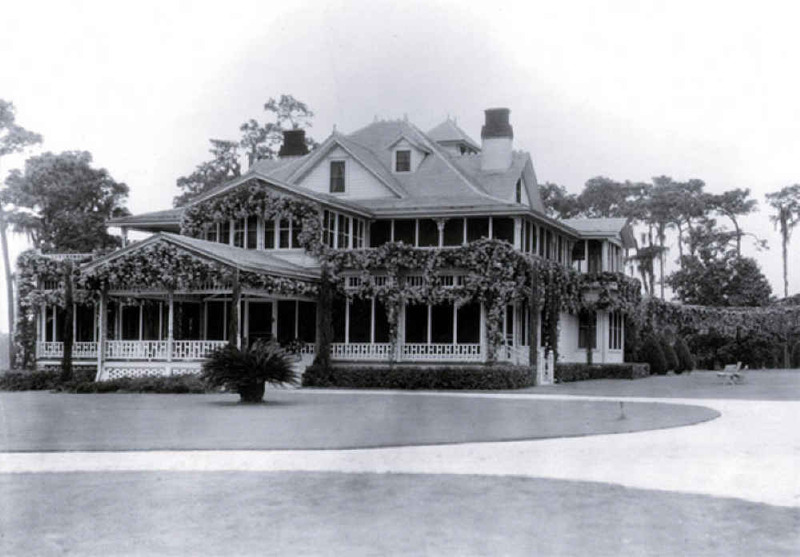 Isabella (Isobel) Taylor STEWART (David STEWART4, Alexander STEWART3, David STEWART2, Daniel STEWART1) was born 31 MAY 1875 in Glasglow,Lanark,Scotland, and died 28 JUN 1939 in Orlando,Orange Co.,FL. She was buried in Apopka Cemetery,Apopka,FL. She married William Graham EDWARDS 27 APR 1897 in Chicago,Cook Co.,IL, son of William EDWARDS and Mary Jane OWENS. He was born 29 NOV 1869 in Edinburgh,Ferfer,Scotland, and died 4 JUL 1934 in Apopka,Orange Co.,FL. He was buried in Apopka Cemetery,Apopka,FL. + 31 i. James Stewart EDWARDS was born 8 MAR 1898 in Chicago,IL., and died 19 MAR 1940 in Orlando,Orange Co.,Florida. + 32 ii. 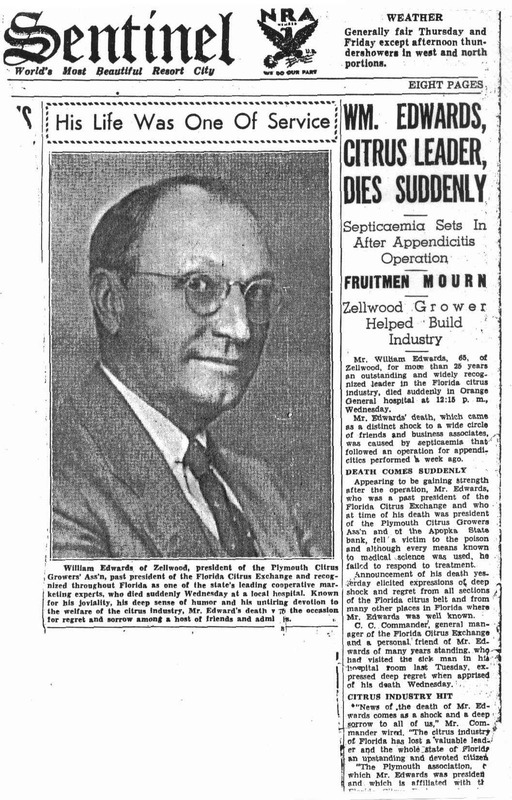 David Stewart EDWARDS was born 28 MAY 1904 in Orlando,Orange Co.,FL, and died 18 JUL 1954 in Orlando,Orange Co.,FL. 33 iii. Margaret Jean EDWARDS was born 1 NOV 1911 in Orlando,Orange Co.,FL, and died 9 APR 1977 in Tampa,FL. She married Alvin COOLEDGE. 34 iv. 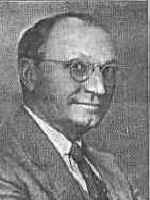 William EDWARDS was born 19 JUL 1900 in Orlando,Orange Co.,FL, and died 16 MAY 1906 in Orlando,Orange Co.,FL. 29. James STEWART (John STEWART4, Alexander STEWART3, David STEWART2, Daniel STEWART1) was born 2 JUN 1924 in Plymouth,Apopka,Orange Co.,FL, and died 16 MAY 1995 in Mt. Pleasant,Gadsden Co.,FL. He married Mary Kathleen JONES. 30. John Alek STEWART (John STEWART4, Alexander STEWART3, David STEWART2, Daniel STEWART1) was born 12 NOV 1927 in Apopka,Orange Co.,FL, and died 11 MAR 1999 in Fort Walton Beach,Okaloosa Co.,FL. He married Living GALE. 31. James Stewart EDWARDS (Isabella (Isobel) Taylor STEWART5, David STEWART4, Alexander STEWART3, David STEWART2, Daniel STEWART1) was born 8 MAR 1898 in Chicago,IL., and died 19 MAR 1940 in Orlando,Orange Co.,Florida. He was buried in Apopka Cemetery,Apopka,FL. He married Blanche Ann GRAHAM. She was born 1899 in Pennsylvania,USA, and died 26 NOV 1933. 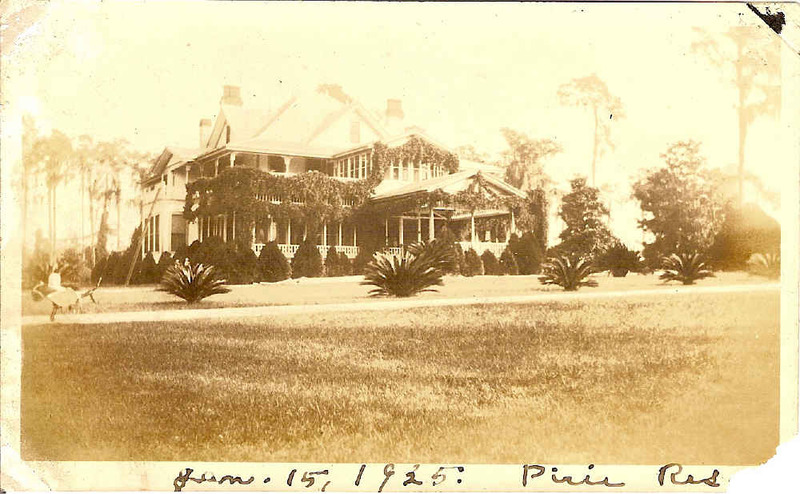 He married Ruth Gerald HOYT 28 MAR 1934 in Eustis,Florida, daughter of Hugh Percival HOYT and Katherine Elizabeth HOAG. She was born 21 JUL 1901 in Remus,Wheatland Township,Mecosta Co.,MI, and died 17 FEB 1994 in Shippensburg,Cumberland O.,PA.. She was buried in Cremated: Plaque Placed At Lot F-22 Riverside Cemetary,Lenawee Co.,Clinton,MI. 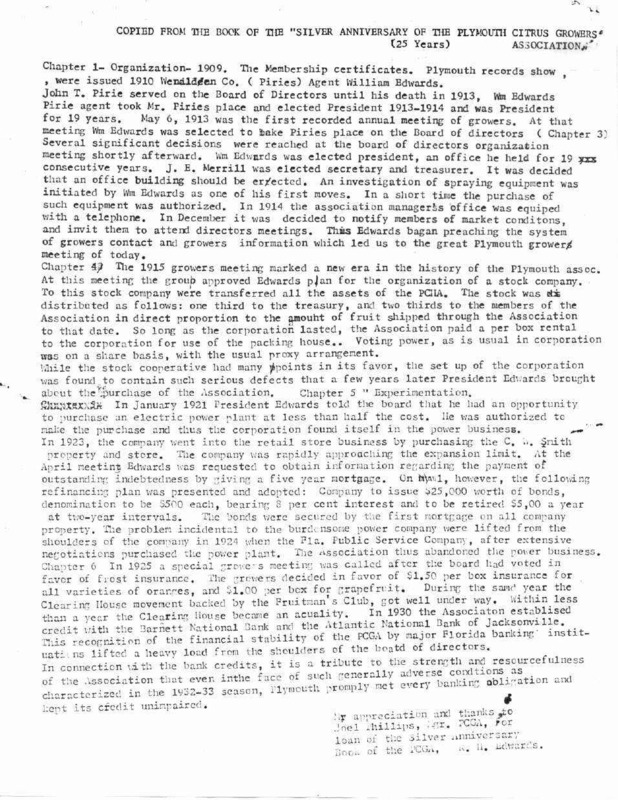 + 42 i. William Graham EDWARDS was born 1 FEB 1924 in Orlando,FL., and died 1 NOV 1994 in Atlantis,FL..
43 i. Stewart Hoyt EDWARDS was born 20 FEB 1937 in Orlando,Fl., and died 20 FEB 1937 in Orlando,Fl..
+ 44 ii. Living EDWARDS. 32. David Stewart EDWARDS (Isabella (Isobel) Taylor STEWART5, David STEWART4, Alexander STEWART3, David STEWART2, Daniel STEWART1) was born 28 MAY 1904 in Orlando,Orange Co.,FL, and died 18 JUL 1954 in Orlando,Orange Co.,FL. He was buried in Apopka Cemetery,Apopka,FL. He married Dorothy BAKER. He married Grace Elizabeth MITCHELL, daughter of Frank Livingston MITCHELL and Grace May DASKAM. 45 i. Living EDWARDS. She married Jean Ellis MABRY. :+ 46 i. Pamela Jean EDWARDS was born 23 AUG 1947 in Orlando,Orange Co.,FL, and died 29 SEP 1992 in Palm Springs CA..
+ 47 ii. Living EDWARDS. 42. William Graham EDWARDS (James Stewart EDWARDS4, William Graham EDWARDS3, William EDWARDS2, James EDWARDS1) was born 1 FEB 1924 in Orlando,FL., and died 1 NOV 1994 in Atlantis,FL.. He married Maxine Codell GERWIG. 44. Living EDWARDS (James Stewart EDWARDS4, William Graham EDWARDS3, William EDWARDS2, James EDWARDS1). She married Living DORSEY. She married Living FORDHAM. She married Living ANDERSON. 50 i. Living FORDHAM. He married Living JENSEN. 51 ii. Living FORDHAM. He married Living. 46. Pamela Jean EDWARDS (David Stewart EDWARDS4, William Graham EDWARDS3, William EDWARDS2, James EDWARDS1) was born 23 AUG 1947 in Orlando,Orange Co.,FL, and died 29 SEP 1992 in Palm Springs CA.. She was buried in St. George,Washington Co.,UT. She married Living LLEWELLYN, son of James Richard LLEWELLYN and Irene CARPENTER. She married Living ADAMS. + 52 i. Living LLEWELLYN. + 57 i. Living LLEWELLYN. + 58 ii. Living LLEWELLYN. 47. Living EDWARDS (David Stewart EDWARDS4, William Graham EDWARDS3, William EDWARDS2, James EDWARDS1). He married Living UNKNOWN. He married Living HERZOG. 59 i. Living EDWARDS. She married Living KELPERIS. 44.Living EDWARDS (William Graham EDWARDS5, James Stewart EDWARDS4, William Graham EDWARDS3, William EDWARDS2, James EDWARDS1). She married Living HARVEY. 46. Living EDWARDS (William Graham EDWARDS5, James Stewart EDWARDS4, William Graham EDWARDS3, William EDWARDS2, James EDWARDS1). He married Living UNKNOWN. 47. 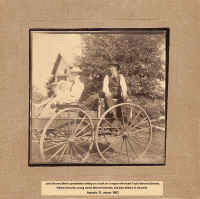 Living LLEWELLYN (Pamela Jean EDWARDS5, David Stewart EDWARDS4, William Graham EDWARDS3, William EDWARDS2, James EDWARDS1). He married Living KNUDSEN. 57. Living LLEWELLYN (Pamela Jean EDWARDS5, David Stewart EDWARDS4, William Graham EDWARDS3, William EDWARDS2, James EDWARDS1). She married Living GRAHAM. 58. Living LLEWELLYN (Pamela Jean EDWARDS5, David Stewart EDWARDS4, William Graham EDWARDS3, William EDWARDS2, James EDWARDS1). She married Living JURGAITIS. She married Living RUSH.